What a crazybusy weekend this was for our family. Friday was Eid al-Adha and then on Wednesday it was Halloween. My brother came into town from the east coast for a quick two day visit. He was not able to leave however, due to Hurrican Sandy. But that worked out for us anyway, since really, who comes to Seattle for two days? So we spent part of the weekend going to Eid parties and the other part carving pumpkins. 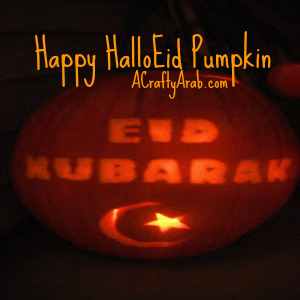 I thought it might be fun to combine the two so I make a Eid Mubarak pumpkin! Here is how I did it. 1) Find a nice big font for your words Eid Mubarak. Since I wanted bold letters, the CK Pumpkin font was the perfect one for me. I ignored all the lines inbetween and the stems on top and just did the outline of the letters. A very important tip: make sure you also mark the inside(holes) of the letters. My brother learned that lesson the hard way. Head over to Bing, take a moment to enjoy the photo today, and do a search on a clip art Islamic crescent moon and star. Print everything out and tape it to your pumpkin. 2) With your poker tool, go around and poke holes all the way around and inside each letter. Take off your paper and use your Xacto knife to cut lines. This part was fun, it was like being in school again and playing connect the dotes! 3) Once your lines are cut out with the Xacto knife, go around with a small scrapping took to cut out between the lines. Side note: I used to be a potter in my pre-kids life. It was a sad day for me when I had to send my potter wheel to a new home found on Craig’s list. But I did keep my tools, in hopes that I’d use them again…and now I have! Since my brother did not know that I had tools left over from my clay days he used a knife for his pumpkin and got very similar results. 4) Once your letters are carved out from the outside about a quarter of an inch deep, you’ll need to carve out the inside of your pumpkin. I used this nifty pumpkin carving tool that came with our pumpkin set, but you can also use a spoon. Try experimenting with a candle to see how much light is coming through your letters before you stop carving. Let’s much say my very thick walled pumpkin took a ton of heavy lifting trips to the compost pile. 5) By the time I got done with all the letters (all 10 of them! ), I was tired of the carving and the dots. So I went ahead and just carved out my crescent moon and star. You call it lazy, I call it texture. Place a candle in your HalloEid pumpkin and watch how many neighbors ask you about Eid. It’s a great conversation starter, and a lovely way to let those around you know that there are many faiths in our great country (and their own back yard!). To learn more about holidays, visit A Crafty Arab on Pinterst.